She does so with a level of energy that only a teenager possesses. She is also, by now, accustomed to the attention. Since the girls’ club was launched in October last year as an extension of the existing boys’ club, the level of international interest has steadily grown. Perhaps more so because of the location and the conditions in which they train. Lyari is portrayed as a crime-infested hell-hole plagued by poverty and gang wars. Read the headlines if you disagree. ‘Brother of slain Lyari gangster netted’; ‘Lyari gang war: five suspects given bail’; ‘Lyari gang war leader Uzair Baloch arrested by Rangers near Karachi’. The latter epitomises the scale of the problem facing Lyari. In January this year, Pakistan Rangers arrested Baloch, the self-styled don of Lyari, as he attempted to enter Karachi. It was unclear how and when he had arrived in Pakistan, having previously been arrested by UAE authorities attempting to cross the border from Oman in December 2014. He faces charges of target killings, extortion, kidnapping and terrorism. Baloch represents a deeply embedded criminal fraternity. Described as both a ‘criminal politician’ and a ‘gangster’, he is a former chief of the now defunct Peoples’ Aman Committee, a militant group tied to the Pakistan People’s Party, and one of numerous criminals targeted by the authorities in Operation Lyari. Initially launched four years ago, and ongoing since September 2013, the operation is a bloody and often vicious government crackdown on gangs and other crime syndicates. It is within this environment that the girls attempt to box. Their surroundings are basic and their exercises rudimentary. They train in a long rectangular room with ventilation brickwork high up on one side and bare breeze blocks below. The star and crescent of the Pakistani flag hangs from the ceiling at varying intervals, and at the far end of the room a single set of stairs rises to the second floor. Outside, infrastructure is limited, medical care is poor, and few of the girls, if any, have personal transport. 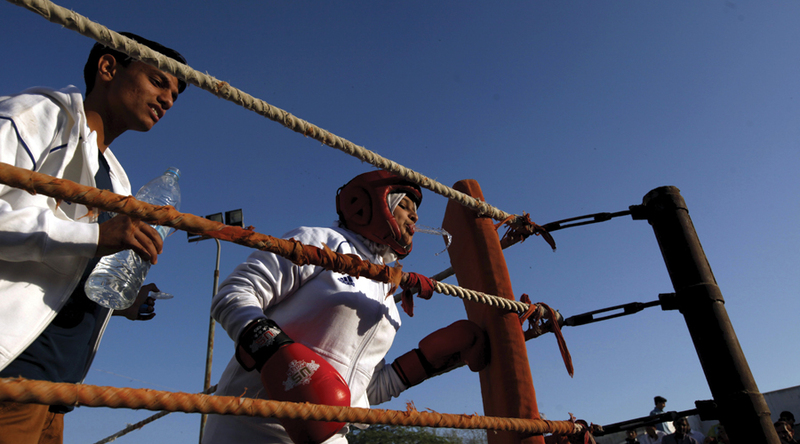 Of paramount importance is confidence, while the club’s single key rule — that they must remain in education if they want to train to be boxers – is strictly adhered to. They arrive each day after school and pray before training. Their exercises are simple, occasionally incorporating small hand-held weights, and they weave and jab when the teaching of form and technique begins. It is in order to give the girls a better chance at life and to encourage equality that the club was established. 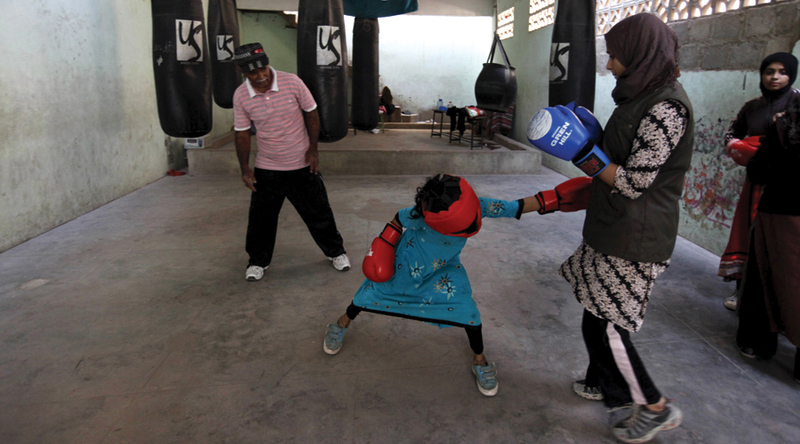 That changed in the middle of last year when Asghar Baloch, secretary of the Sindh Boxing Association, contacted Younus and said he was negotiating with the government of Sindh to organise a women’s boxing camp. Younus was invited to join this mission. 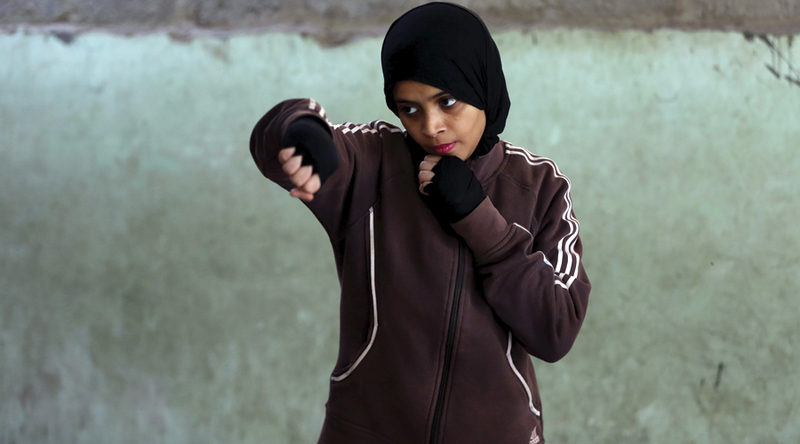 “There was, however, a very serious situation in the field of women’s boxing at that time due to the cultural environment,” says Hussain. “Younus was afraid of the adverse reactions of people in the area. He discussed the matter with me – I was also a boxer in my teenage years – and at first I refused to put the girls at risk. But subsequently I agreed, at least for their own self defence. 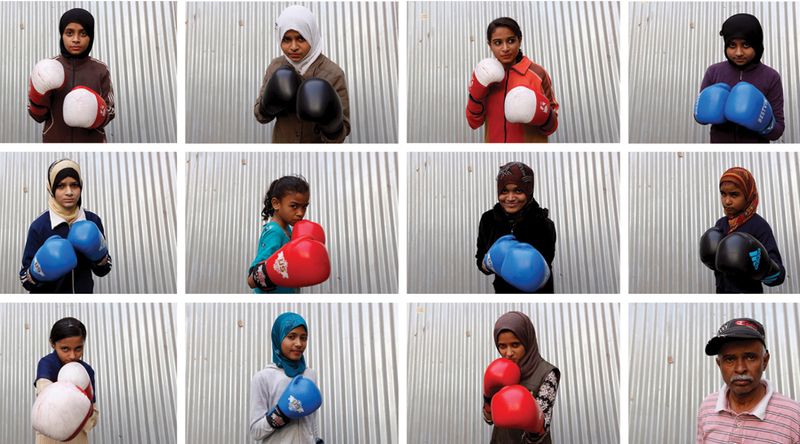 Eighteen girls are currently training at Pak Shaheen Boxing Club. All are between the ages of nine and 17, come from poor and underprivileged backgrounds, and strictly adhere to Islamic and local cultural mores. Although most live nearby, some travel from as far afield as Korangi, a town in the eastern part of Karachi.